Harare (Agenzia Fides) - Three people killed, around 200 wounded, more than 600 arrested. This is the toll of the clashes which took place in past days in Harare and in other cities of Zimbabwe, between the police and demonstrators protesting for the rise in fuel prices. Among the arrested there is also baptist pastor Evan Mawarire, protagonist of the protest movement against former President Robert Mugabe, forced to resign in November 2017 (see Fides, 22/11/2017). Since then, the Country has been governed by Emmerson Mnangagwa, who had assumed the post of interim Head of State following the resignation of Mugabe before being elected in the elections held at the end of July. 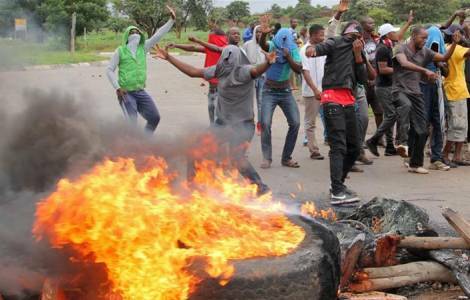 Mnangagwa has so far failed to improve the difficult economic condition of the Country and the increase in fuel prices has triggered a violent protest, fueled by messages conveyed through social media. A fact that was reported by the Zimbabwe Catholic Bishops Conference (ZCBC), which in a note sent to Agenzia Fides, expresses its concern for "the wide circulation of hate-filled social media messages, calling for the nation to take to the streets to protest against the economic hardships". "The economic situation is not favourable to the general citizenry", acknowledges the Episcopal Conference, which however launches an appeal "to citizens to exercise restraint and avoid reacting in the heat of the moment to give room for dialogue with all stakeholders".